The Quarterdeck Inn and Marina Resort, Port Hardy, BC. 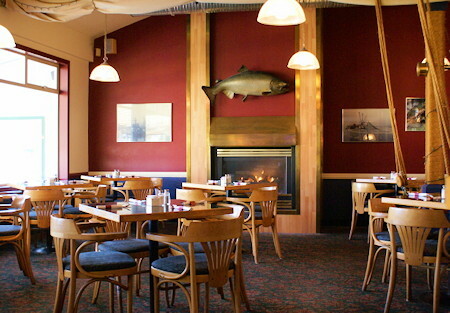 Resort Hotel, Marina & Pub Restaurant, Port Hardy, Vancouver Island, British Columbia, Canada. The Quarterdeck Inn and Marina Resort, Port Hardy, BC. Resort Hotel, Marina & Pub Restaurant, Vancouver Island, British Columbia, Canada. complete with marina and Pub-style restaurant, and you'll appreciate our closeness to downtown Port Hardy and the many tourism and business services. Let the Quarterdeck Inn and Marina Resort, in Port Hardy on Vancouver Island arrange the British Columbia wilderness experience of a lifetime with whale watching, salmon fishing, eco tours, kayaking, diving, storm watching, or hiking pristine beaches just a few of the choices available to you, plus a water taxi service. 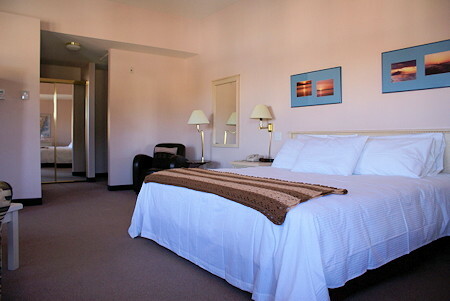 plus your room includes a hair dryer, telephone, cable TV and high speed internet access. Our suites feature bathrobes and upgraded amenities, and there are also fireplaces and jetted hot tubs in our executive suites. plus we feature a banquet room and meeting facilities for up to 35 people. Our marina, with 1,000 feet of new and reconditioned docks, continues to be the choice of mariners from California to Alaska. We offer moorage for vessels to 150 feet, 120 slips for boats up to 35 feet, as well as 15, 30, or 50 amp power, and water is available throughout the secured facility. 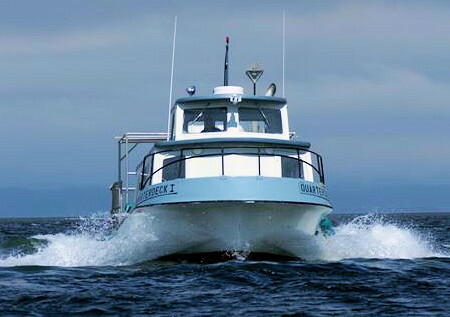 The marina fuel station offers a wide variety of products including propane and natural gas. The Quarterdeck Marina Store offers marine supplies, tackle, licenses, charts, ice, local information and of course the friendly service that the Quarterdeck Inn and Marina Resort is famous for. The Quarterdeck Inn and Marina Resort is also able to provide you with a wide variety of Adventure Tour packages so that you can enjoy the wilderness experience of a lifetime! 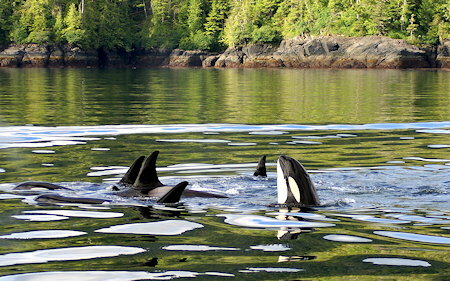 These Vancouver Island adventures include whale watching, saltwater sport-fishing charters for BC Salmon and Halibut, Scuba Diving, ocean kayaking, wildlife eco-tours, along with hiking tours and more. 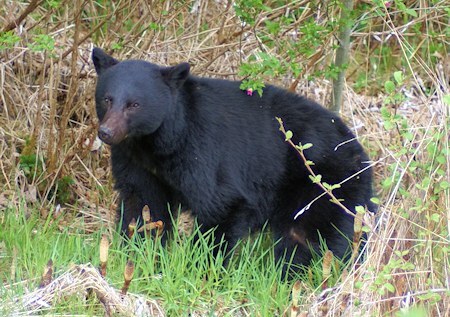 You can also just enjoy sight-seeing, a pleasant stroll along the pristine beaches near and around Port Hardy, visit the museum, shop for local arts and crafts, watch local Native carvers at work, or walk the seawall. 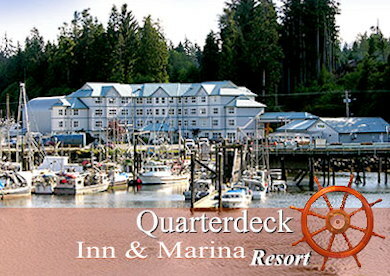 The Quarterdeck Inn and Marina Resort is located in Port Hardy, on Vancouver Island British Columbia. Call us today, or visit us online to book your next stay or vacation in our full service Three ½ Star Hotel, complete with Marina, and Pub style restaurant. 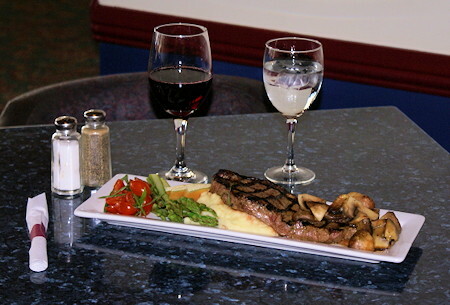 The Quarterdeck Inn and Marina Resort is close to downtown, and all tourism and business services in Port Hardy. Highway 19, the main highway serving Vancouver Island, links Port Hardy with Victoria and all other major centres on Vancouver Island. 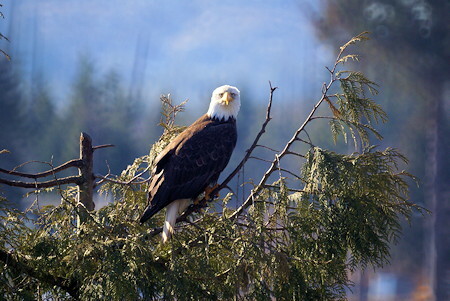 Port Hardy, Vancouver Island, British Columbia, Canada.